The Orchard is Overflowing | Keeps Me Out Of Mischief! The orchard well the back garden really, we’re not that grand! is overflowing with fruit. There’s apples, pears and blackberries and something needs to be done with it so it doesn’t all go to waste. I’ve stewed down some of the apples so I can experiment with substituting applesauce for butter in some recipes and I’ll take the rest of the apples into school so that the children can have a taste of a ‘real’ apple which hasn’t ever had anything sprayed on it. The blackberries aren’t quite ready for picking today but the pears are falling from the trees though they aren’t quite ‘eaters’ yet. I had to make something with the pears though and I’ve found that they work well in an upside down cake, so your offering today is Upside Down Pear Cake. Preheat the oven to 180°C/ 350°F and grease a loaf tin. Grease it as though your life depended on it, I’ve learnt my lesson after countless ‘less than pretty’ cakes that required hacking out of the pan! Sprinkle the demerara sugar across the base of the pan and shake it about until it’s well covered. 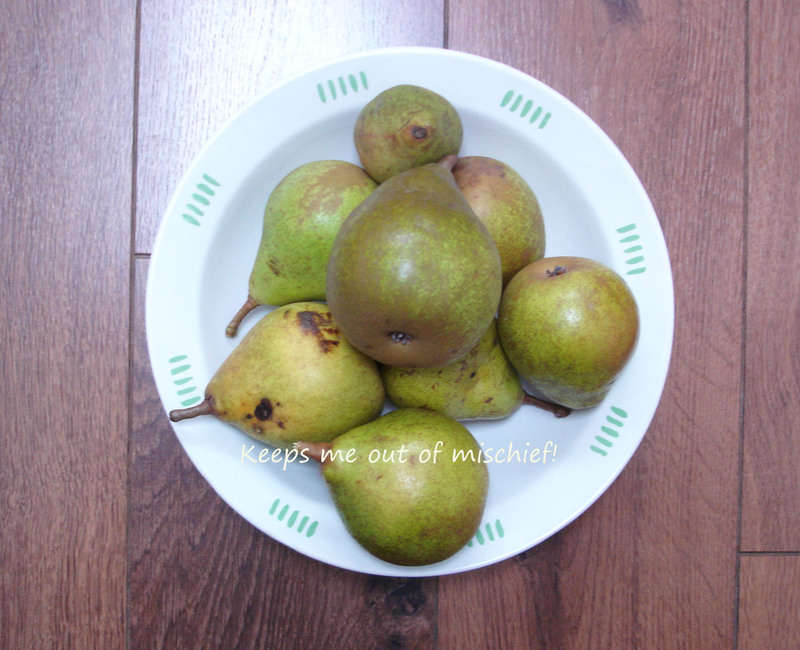 Lay a row of sliced pears across the base of the pan as shown in the picture above. In a large bowl combine the butter and caster sugar until they are creamy. Add the eggs one at a time and then the flour, milk and the chopped pears. 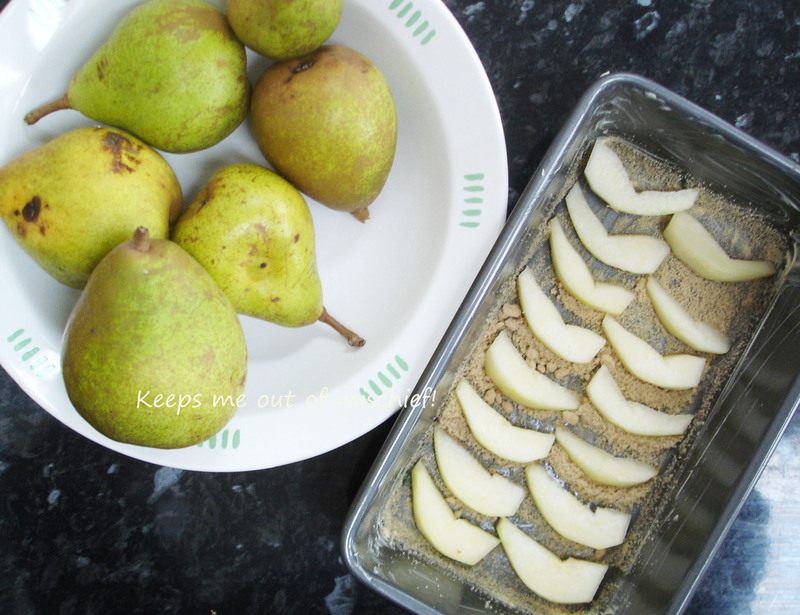 Carefully spoon the mixture carefully into the loaf tin trying not to disturb the pears. Gently tap the bottom of the tin on the work surface and smooth the top. Place in the oven for 50 minutes or until a skewer inserted into the middle of the cake comes out clean. 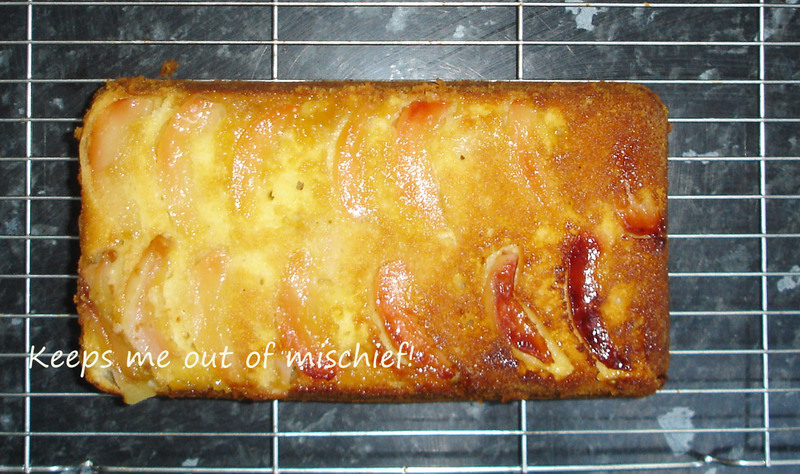 Place the tin upside-down on a wire cooling rack and leave the cake inside the tin to cool. Gravity is your friend here, it’s going to help the pears to peel away from the bottom of the tin. Enjoy! That sounds like quite a challenge – I don’t think I could manage a new recipe a day! I love that you made this in a loaf pan. I’m super jealous of your ample backyard fruit supply!! I love making loaf cakes, they’re so much easier to cut up into portions!